Call Now for Siding Services! Since 1994, EJT Custom Exteriors Inc. has been providing roofing services to customers in Egg Harbor City, Landisville, Hammonton, Cedar Brook and the surrounding areas. Our skilled staff has the expertise in assisting you with all your home improvement projects. Discuss your ideas with us and we will turn your dream into reality. 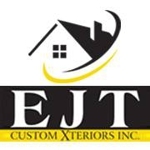 EJT Custom Exteriors Inc. offers durable roofs that will keep your home protected. Whether you need custom additions or roof repairs, we will handle it all efficiently. Our professionals will finish your job on time and based on your requirements. To schedule an appointment, give us a call today at (609) 270-1972. Copyright © 2018 ejtcustoms.net All rights reserved.